Let’s face it – playing golf can be hard work for some of us, and in the summer (or on any other golf course in a tropical environment), you might end up sweating a whole lot faster than expected. The sweltering heat can get to you, and there is every possibility of it affecting your game, so why not make sure that you will be able to travel in relative comfort from one hole to another by equipping your golf cart with the $899.95 Golf Cart Cooling System? Hey, nobody said that golf is a cheap sport. 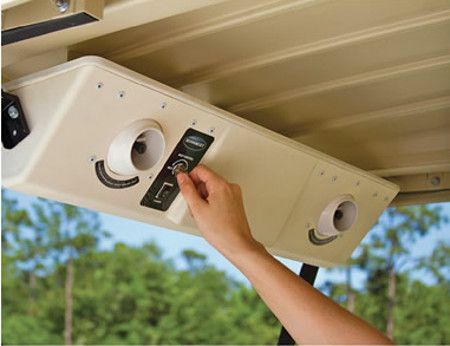 Since you would like to impress your potential business partner or simply travel in comfort, the Golf Cart Cooling System does sound like a perfect addition to any golf cart. It comprises of an evaporative misting fan system which can be attached to just about any golf cart, helping reduce ambient temperature by as much as 30º F. A couple of fans with built-in nozzles will work to create microdroplets of dry mist which will do its bit to cool both golfers between holes, all without the unwanted result of dampening surfaces or clothes. There are three speeds to choose from, and you can even choose from dry or wet mist thanks to a twist of a dial to suit your cooling preferences. There will be a one-gallon water tank that offers up to seven hours of mist, just in case you were wondering how many rounds of golf it can work for.